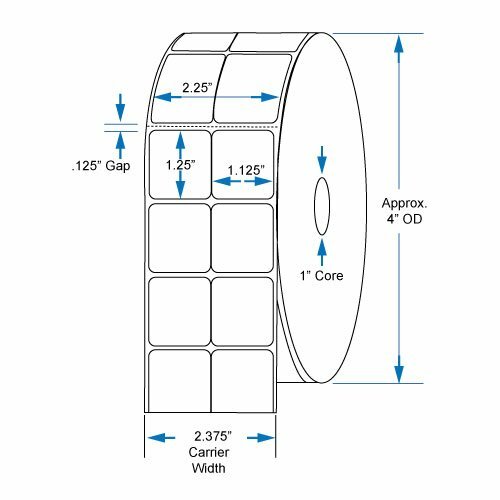 800127-101 Compatible KENCO Brand 2.25 inch x 1.25 inch A center vertical slit creates two 1.125 inch x 1.25 inch labels with perf Direct Thermal Labels to fit Eltron or Zebra Printers. 1 in. Core, 1,135 Labels Per Roll, 12 Rolls Per Case by Kenco at MDA-MA. MPN: 142.25x1.25DPO2. Hurry! Limited time offer. Offer valid only while supplies last. 2.25 inch x 1.25 inch A center vertical slit creates two 1.125''x1.25'' labels with perf white direct thermal labels to fit Eltron or Zebra printers. 2.25 inch x 1.25 inch A center vertical slit creates two 1.125"x1.25" labels with perf white direct thermal labels to fit Eltron or Zebra printers. Supplied 1,135 labels per roll, 12 rolls per case.